The HJCINTL cell phone signal booster simply amplifies your existing signal to give you more bars and maintain fast data speeds while you browse the internet or talk on the phone. 1. Mount the Outdoor Antenna. Choose a location for the Outdoor Antenna using your cell phone to determine the area of strongest signal. 2. Place the Base Unit where you want to create a Cell Zone. For the widest possible signal area, position the Base Unit near the middle of a room. 3. 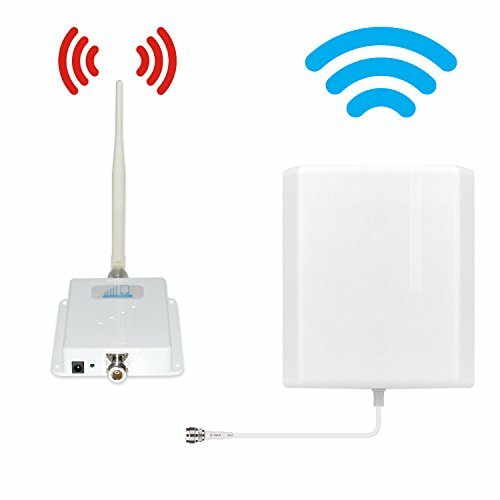 Connect the Indoor Antenna to the Base Unit and place it where you need signal. 4. Run the provided coaxial cable between the Base Unit and Outdoor Antenna. The HJCINTL cell phone signal booster supports voice and 4G data for 4G/LTE ATT T-Mobile Cell phones, including IOS , Android, Windows Phone Systems, etc. 【Excellent Function】- Reduces dropped call, better voice quality, faster uploads and downloads. No more slow internet connections or long buffer times while watching your favorite streaming tv shows and movies. Give your smartphone, tablet, data card, and notebooks boosted speeds all at the same time while using the Home 4G. 【Stop dropped calls】- Boost 4G LTE cell phone signals in your home or office with a signal boosting range of up to 1500 sq ft. The booster simply amplifies your existing signal to give you more bars and and maintain fast data speeds while you browse the internet or talk on the phone. 【Easy to Install】 - All of the components you need for installation are included in the package with easy to read, step-by-step instructions. Requires no technical experience with easy plug-and-play style setup, safe and convenient to use. 【Warranty】- One Year Warranty! With FCC authentication certificate and quality guaranteed.Providing you with the friendliest customer service.Your satisfaction is our goal! Any problem, please kindly contact us. If you have any questions about this product by HJCINTL, contact us by completing and submitting the form below. If you are looking for a specif part number, please include it with your message.